If you have any Facebook page of your brand or business to attract and update your fans or customers, that doesn’t mean you don’t require a home on the Web. It is quite essential to have a website to appear as a legitimate entity. With the advent of website builder like Weebly, Wix, etc., it is quite easy to setup a genuine and professional-looking website. These website builders are readily improving, and there are a lot of companies appearing as their competition. But first, we should investigate the requirement of a web page in the current scenario where social media remains to be a dominant place. First, at the personal level, you wouldn’t want to direct the potential employer to your Facebook page which means that a personal website makes sense as an online and custom resume, Secondly, building your website provides you far more choices when it comes to design. You can also get control over various products and services which you wish to sell. At last,, by making a dedicated site, you can make your business look like more authoritative and trustworthy. 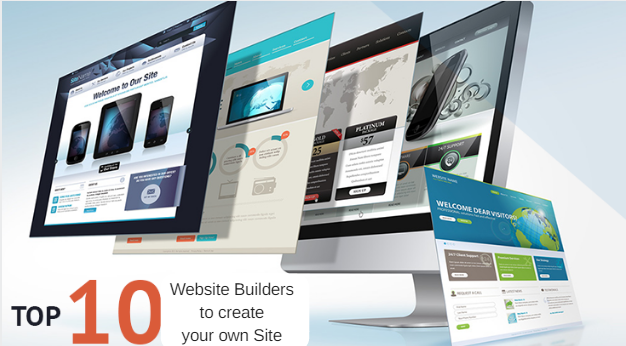 Today, with the advent of online site builders, you can create your customized website without breaking a sweat. The services that are included here allows you to make a well-designed, mobile-capable site with just some technical knowledge. These services drive small business to profitability with buy links, online stores, and various money-making choices. Larger businesses often spend a lot of money to build their custom designed site. However, the small businesses don’t require to spend so much money as they can avail the capabilities of these website builders as low as mere $8 per month and some time to create a unique and appealing website. Most of these services provide free options but if you select this path, you site will consist branding of the provider which can make your site looking less impressive to the shoppers. With all the services, you can easily build your website via simple drag-and-drop interfaces. These services allows you to add social share buttons, blogs, media players, etc. Before you process to build tour website, you will require an address for it. Most of these site builders can register a unique domain for you and provides you a web address via the provider’s domain. These services allows you to use the domain that you have acquired from any third-party but you have to pay the site builder for this privilege. In all of these services, you first have to choose a template from these services to start building your website. They also comes with full images in the background. Some services also use templates that automatically reformat your site for better view on mobile devices. Any modern site builder must have the provision to create sites that are compatible with mobile. Some builders like Weebly and Squarespace utilizes responsive design approaches to building a mobile site from the website you have created for the Web. Responsive designs are quite important, but when it comes to SEO, search engines really account the fact that the site displays correctly on mobile screen sizes. They aren’t concerned whether it stretches as you increase the screen size. However, there are few site builders which provide no ability to control over the mobile-view of the site. Still, there are builders like Wix, which provides a mobile-site preview and also make customizations which will only apply in mobile viewing. We all know that to make a great website, pictures are quintessential. The site builders provide certain options for photo and gallery display, Builders like Squarespace and Wix provide a huge number of stock photos which you can use. Some builders allow you to edit the images with tools like cropping, brightness and all. Weebly provides an entire gallery of styles for your own galleries. In case you wish to go for sales, you will require to more up to a specialized Web shopping cart service such as Shopify. All the services do provide some abilities to sell items via your site. There are numerous advanced options which provide you with the capability to process credit card payments along with adding your own cart and checkout pages. Most of the powerful site builders come with email marketing, inventory and shipping tools to name a few. All of the site builder mentioned her allows you to Facebook Like or Twitter Follow buttons on your web pages, and even allows you to include feeds from social networks. Few of the services assist in building a Facebook page and also tie them into your site design. Most of the services here can provide you information about site traffic although this varies a lot as per different services, and are often included with a premium account levels. As you can clearly see that there are many factors to consider before you choice an easy online website builder. Mentioned below are few of the site builders you can choose from. Wix is among the most featured website builder around which you can use to make a website of your own without any cost. With its great interface along with free accounts, site states and source code which is downloadable, Weebly is the perfect choice. This service is famous mostly for its domain registration and site hosting, this service also provide basic and simple website builder with few limitations. This service provides easy and powerful website builder along with strong mobile site creation and comes with Web storefront functions. This service provides modern and responsive website for both desktop and mobile and also allows you to expand your site for full scale commerce. This service allows you to create responsive-design sites, but it is quite harder to use. It lacks few of the common features. Jimdo provides all the professional tools to you to create a professional website for free, but its competition offers more features. This service allows you to build any site online but lacks modern offerings given by Squarespace and Weebly. It allows you to make a well-designed site without quite an easy. However, it does come with limited customization. This easy to use site builder is loaded with site widgets but lack in features when compared with Weebly and Squarespace. I am familiar with almost all of the above website builders and they are really good for those who can’t code.